The vinciDuino is here. It is a clean room implementation of the Arduino Leonardo platform, and a complete USB-based microcontoller development system. Throw away that FTDI cable and go native-USB. Plug it in, connect a mini-B USB cable and you can start writing code immediately. With the built-in AVR bootloader or with FLIP you don't even need an AVR programmer. 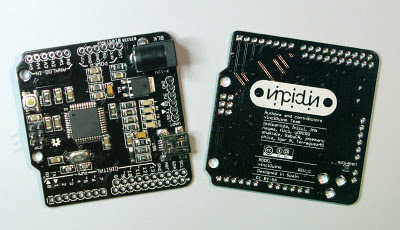 The board is compatible with current Arduino boards and shields. It has the same form factor of the Arduino Pro with the same pinout mapping as any Arduino. So dive into the Arduino Leonardo and get a head start with the vinciDuino. Programming couldn't be easier, it is fully compatible with Arduino's IDE when choosing Leonardo as your board. We have put the Arduino Leonardo bootloader in there and it works just great. Unlike Leonardo, the board has the second UART conveniently broken out from the board with a header connector compatible with all our product range, Sparkfun's FTDI basic and/or cable. No more slow time consuming UART bit banging, use the native USB interface at the same time as the second UART. The limited edition is back, after its huge success we ordered some more. Kits and bare boards will be sent with green solder mask though, the rest of the options will ship in black (visit our store for details). This board was designed by enthusiasts of the Spanish Arduino forum (link) being electroFUN one of its main creators. If you like the link or the board don't hesitate in supporting us by buying one or dropping us a line in the forum link. The nice thing about the vinciDuino is that it's been designed with sufficiently large components for people who are beginning to solder SMD. So why not build your own while you learn SMD soldering! As for all our product line, we will give you the option to get a bare board, a kit or a fully assembled tested board. Checkout the board specs here.